Join the discussion on our forums! 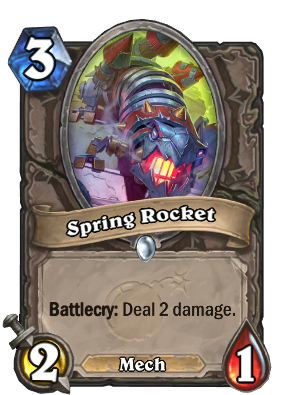 Come discuss Spring Rocket over in our dedicated Spring Rocket discussion topic. "I use him even in my non-Cthun decks. Look at the value. He's basically strictly better than Stormpike Commando"
"Nice card, not only in C`thum decks"
"Lol, I'm kinda tempted to run this in a deck without C'Thun"
"This thing's great without the C'thun ability"
"This would be playable without the C'Thun effect. It's almost always better than Argent Horserider because the battlecry gets past taunt." What a bad card. Only useful if you play it on Turn 3, bad. Arena card for sure, it's still decent and it serve as an little answer like Fire Plume actually is. Disciple of C'Thun, but you're swapping out the reason you put this in your deck for a mech tag.